For a few years in a row when we were younger, my family (minus my Dad) and our best family friends (Laurie from LA’s family) would make a trip out to NYC. 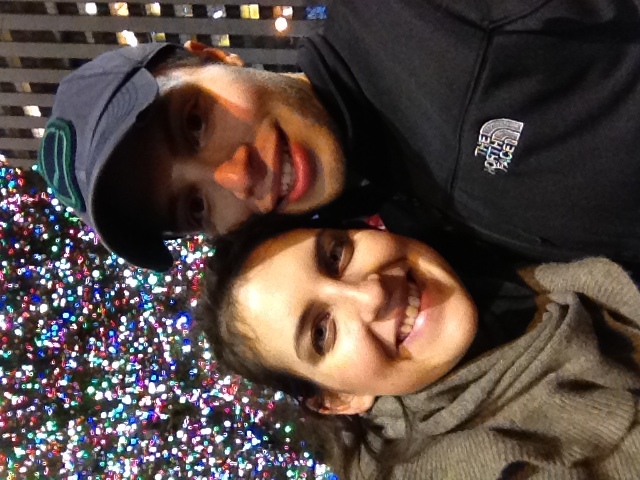 We would eat at Carnegie Deli, shop in Times Square, play in FAO Schwartz, and see a Broadway show that we were given tickets to for Chanukah. Since the tickets were our “big” Chanukah present, we would always end up going a few months after the holidays. 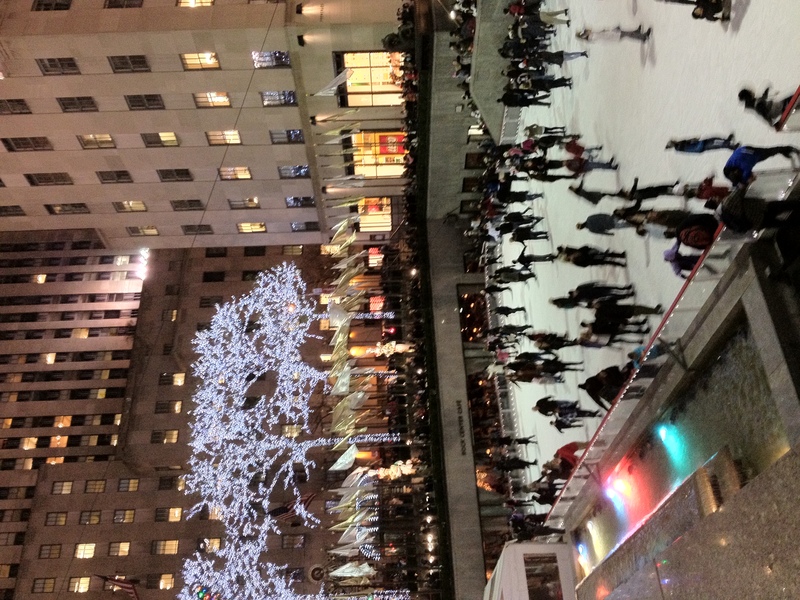 Knowing how many times I’ve been to New York, it is crazy to think that I’ve NEVER seen “the tree”, ice skating, or the Macy’s window displays. 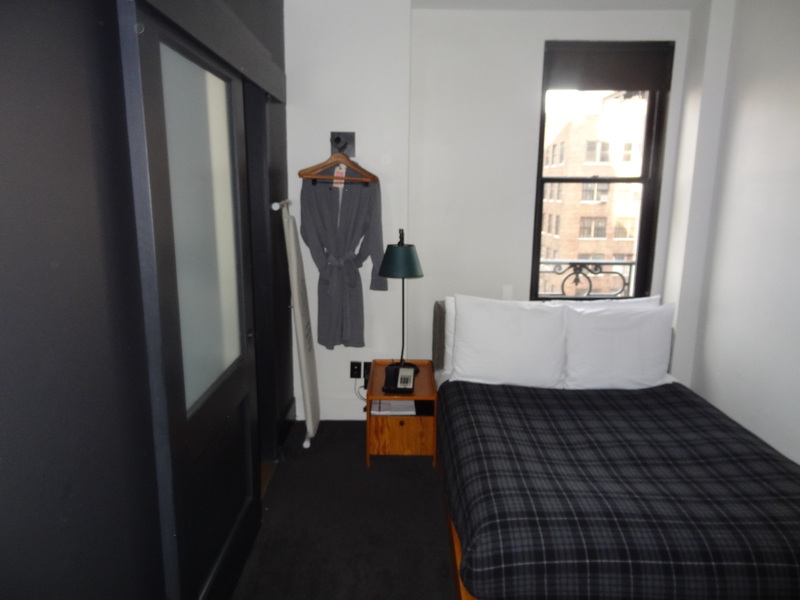 In August, I saw a great deal on Travelzoo (the best website ever, join their Top 20 weekly mailing list… do it) for a funky hotel in Midtown for only $99. I didn’t even research the hotel past checking the location and booked it, thinking that this could be my first time going to the city for Christmas!! I took a half-day at work and Dave and I headed up via NJ Transit shortly after 1pm. We arrived to the Ace Hotel on West 29th around 3pm and were shocked when we opened the lobby doors. The place was packed. It was dimly lit with large sofas all around. People sat drinking coffee, chatting, or on their laptops. WHOA. This is not the type of place I was expecting when I booked a $99 room called the “cheap” room. Dave explained to me that this is exactly what it’s like in a hostel… but much nicer. 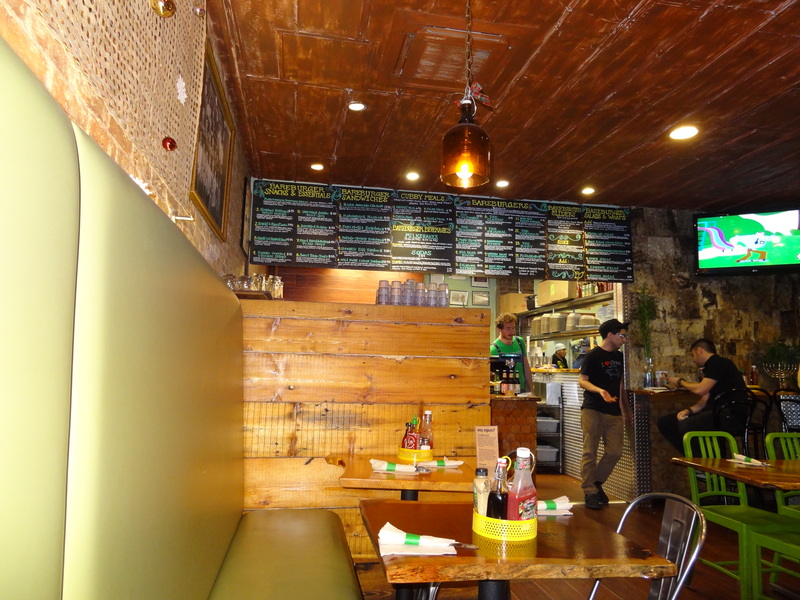 It was like the Mecca to hipsters, almost everyone was in skinny jeans and a fedora hat. Cool. We were only more impressed with the place when we checked into our room. 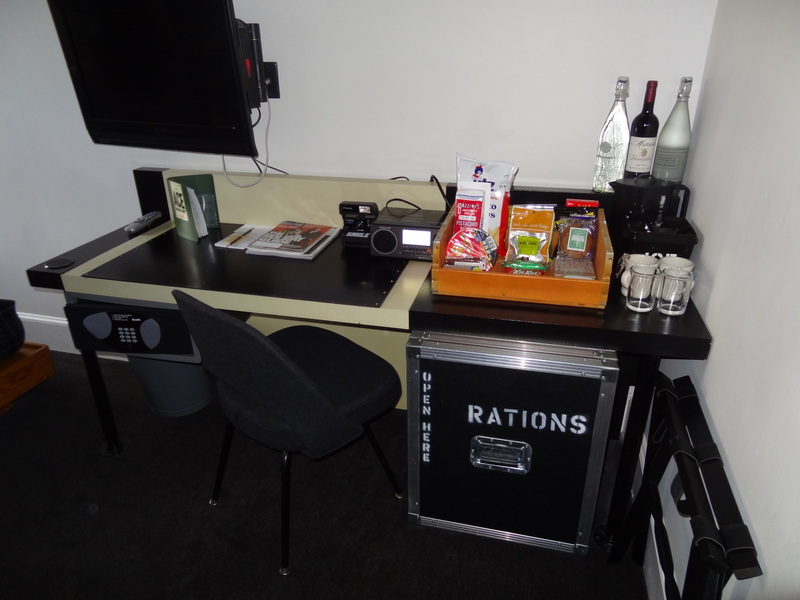 The desk was covered in snacks and the minibar was full, in a locked door labeled “rations”. Very clever. 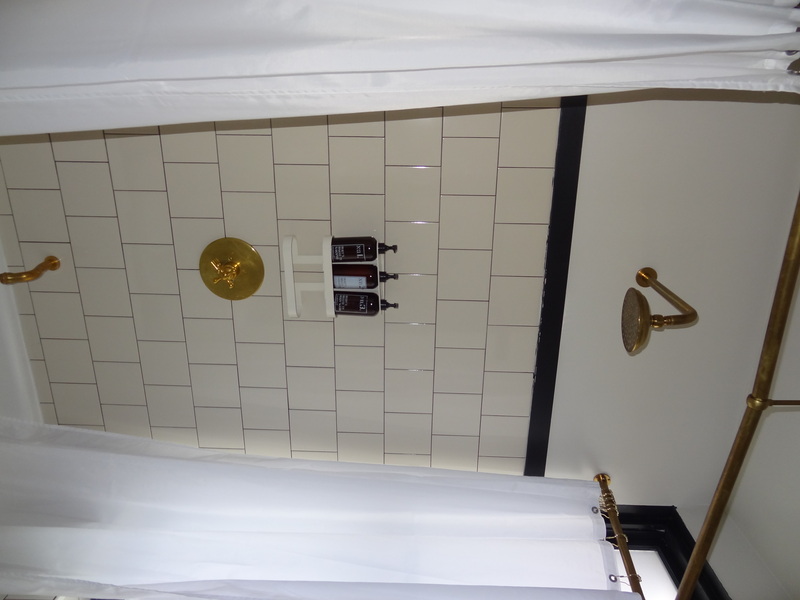 We had sweatshirt material bathrobes, and a free standing bathtub equipped with a rain showerhead. 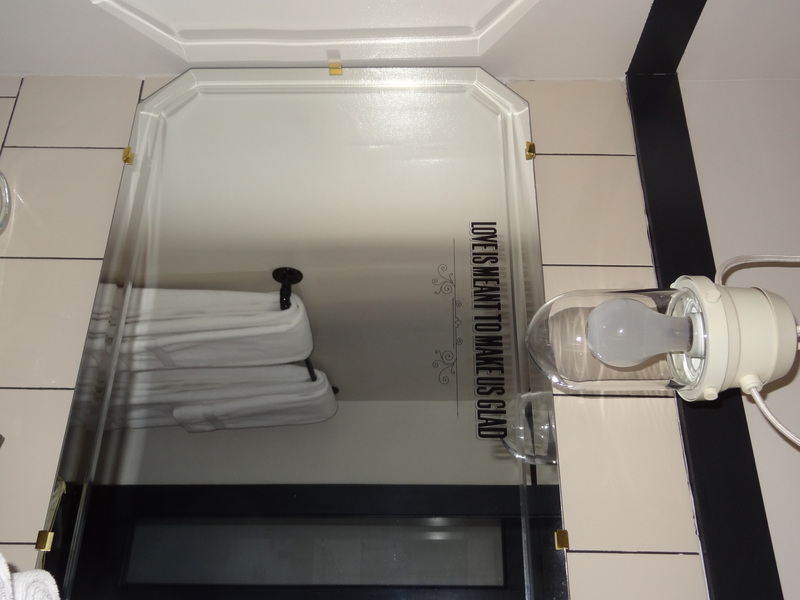 The bathroom mirror was even adorable. "Love is meant to make us glad"
If I haven’t sold you yet, you have to check out our view of THE EMPIRE STATE BUILDING. I couldn’t believe this place was only $99. What a steal. Our view of the EMPIRE STATE BUILDING!! After checking into hipster paradise, we took a nice walk down to Bareburger which was recommended to us by a few friends. 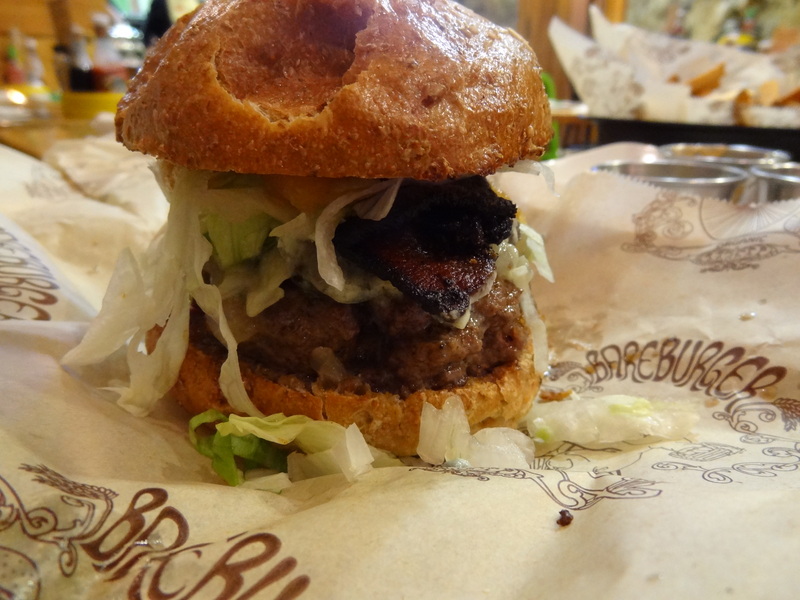 Bareburger is exactly what it sounds like… organic, grass-fed, free range, all-natural, yadda, yadda, yadda. The service was fantastic, she was very knowledgeable and was able to give suggestions when I asked her. We were starving so we decided to order the Assorted Pickles, French Fries, and our own burgers. The Assorted Pickles came in four mason jars. 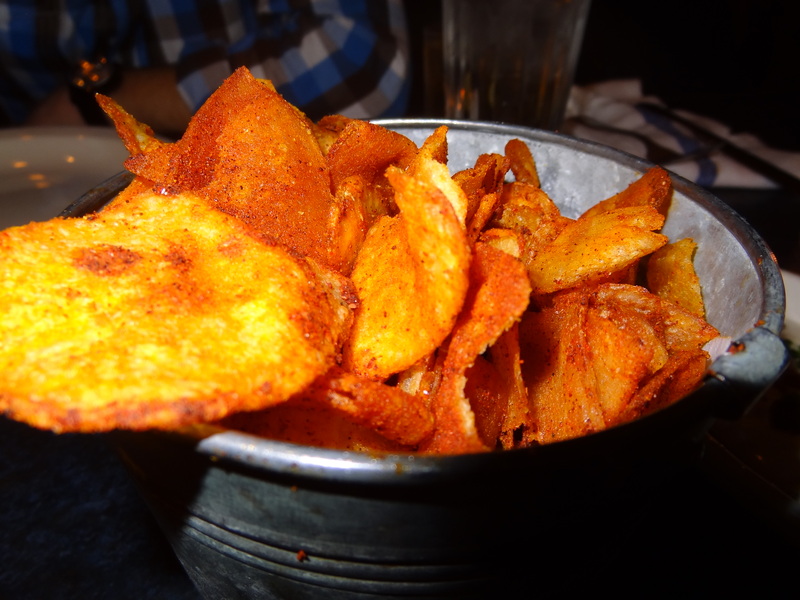 My favorite was the Spicy Sriracha-Habanero Crinkle Cut Pickle Chips. 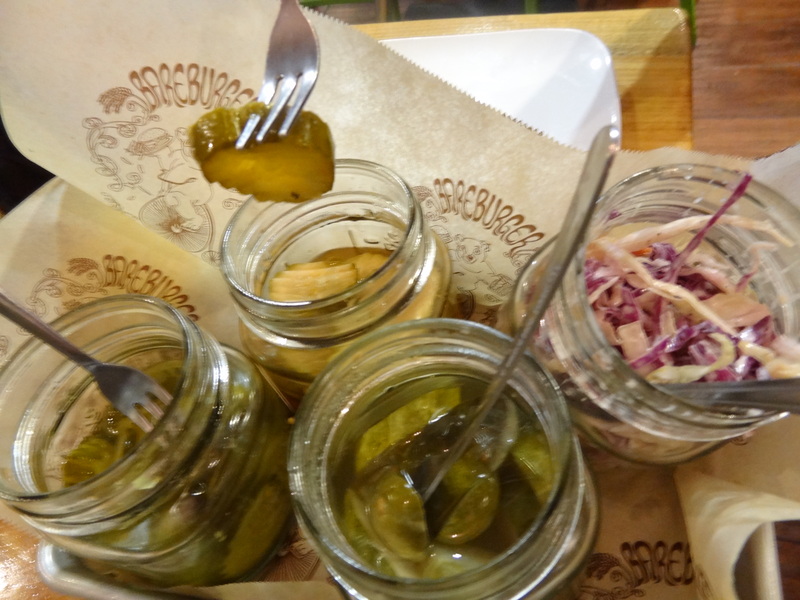 It also came with Garlic Dill Pickle Chips, House-made Coleslaw, and Bubbie’s Bread and Butter Pickle Chips. 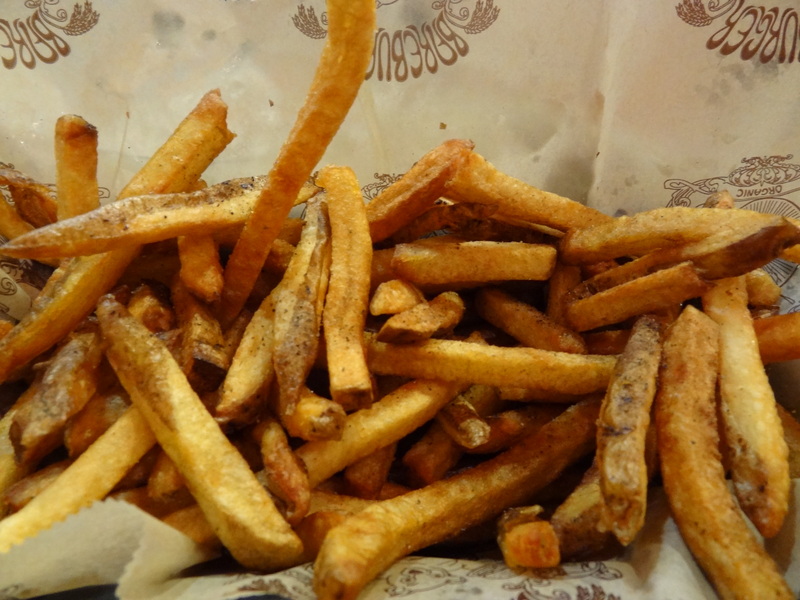 The Fresh Cut French Fries were to die for. They were perfectly crispy on the outside but soft inside. 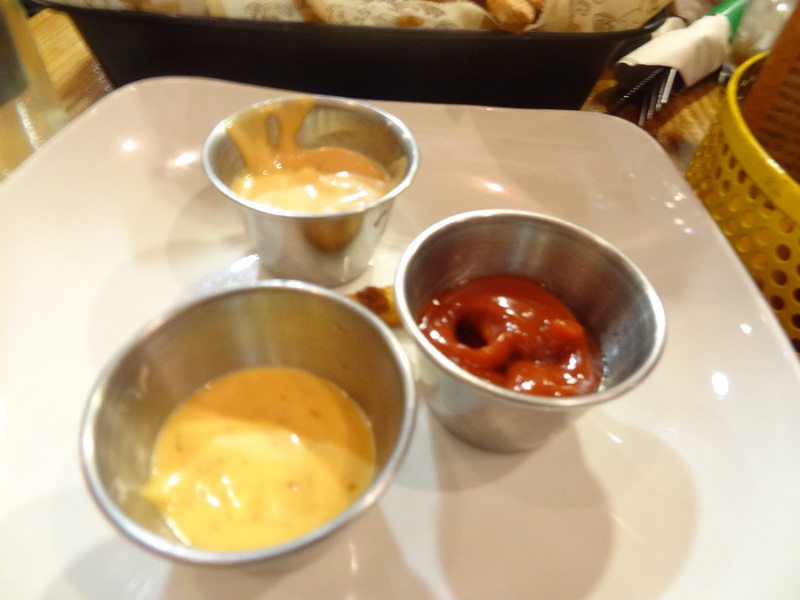 The fries were also served with THREE delicious dipping sauces: Spicy Chipotle Mayo, Bareburger Special Sauce, and Curry Ketchup. MMM! The menu allowed you to pick your own meat and roll for the burger, choosing between beef, turkey, veggie, chicken, lamb, boar, elk, bison, and ostrich- all organic. As tempted as I was to try one of the more interesting meats, I had to order a Bison Burger… I really like them and I never get to eat them! I chose the Bison Big Blue Bacon Burger. That’s a lot of B’s! Everything was really tasty but the star of the meal for me was the fries, for sure. 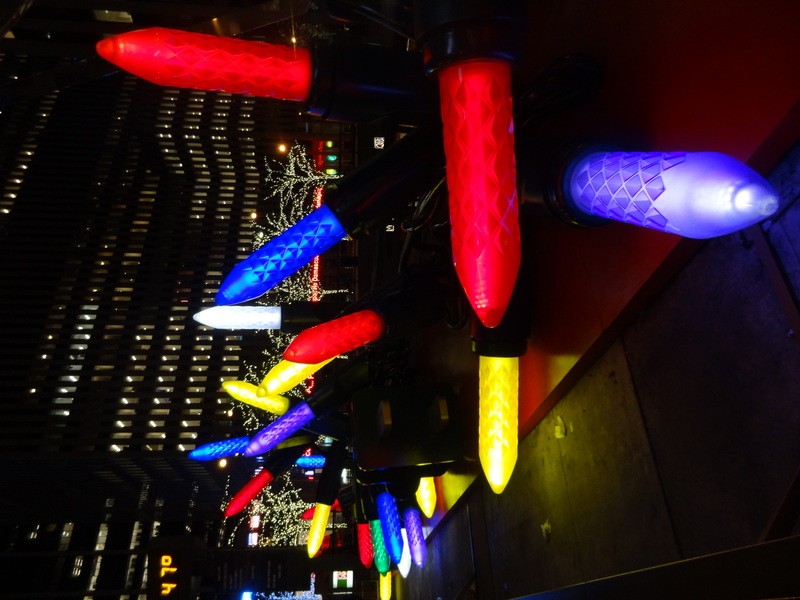 After our late lunch, it was time to finally see the Christmas sights of NYC! We walked through the city and arrived at The Tree just after the sun set. It was a mob scene, but we made our way to take some pictures of it. 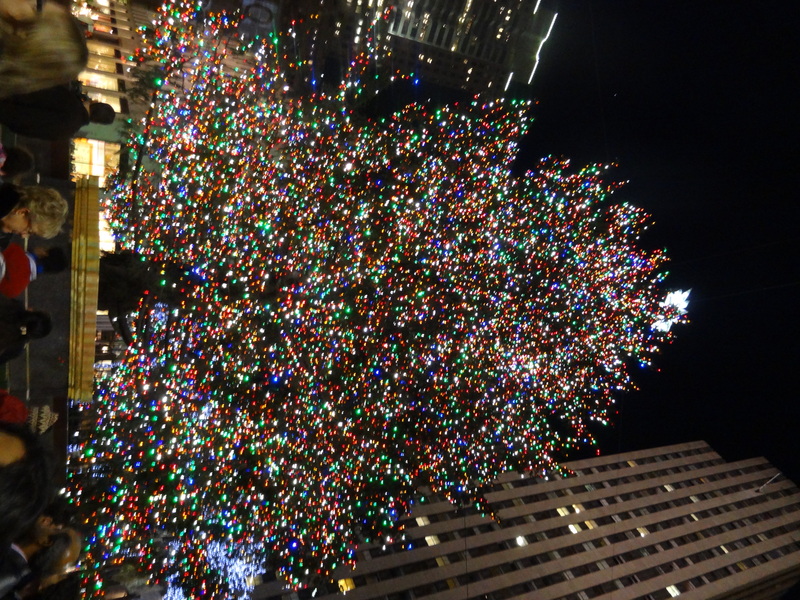 The size of the tree isn’t what was so impressive to me, but the fact that there were SO MANY lights was just unbelievable! You could hardly see any part of the tree that wasn’t covered in the tiny rainbow bulbs. 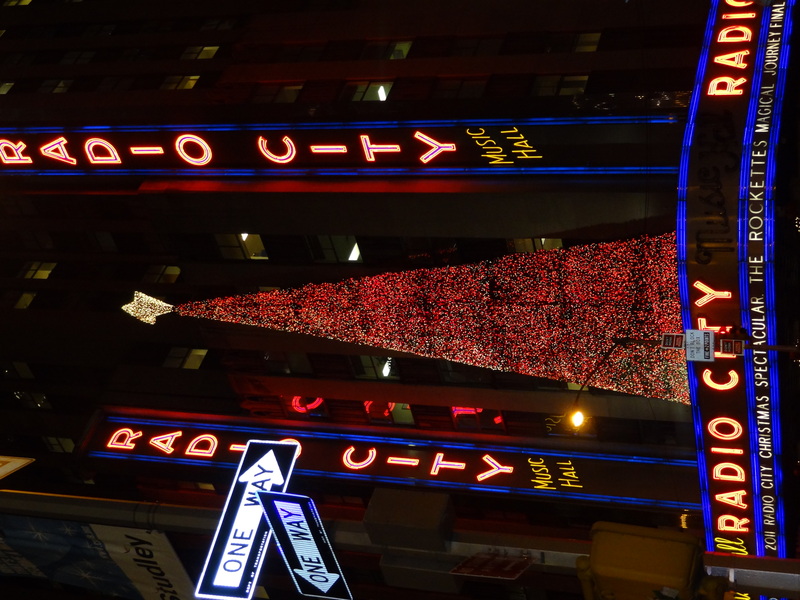 After snapping a few photos, we left to walk past Macy’s and head back to the hotel. Although I really hate things that are big when they should be small (and vice versa) .. I thought this was really pretty! Lauren, our friend from our trip to Israel, took a train in and met us at the hotel just in time to share a bottle of Strawberry Champagne. Our next stop was Whiskey Rebel for a drink before dinner. Lauren and I ordered Margaritas, and Dave ordered well… Whiskey!! Not too long after, it was time to head over to Blue Smoke for some BBQ! 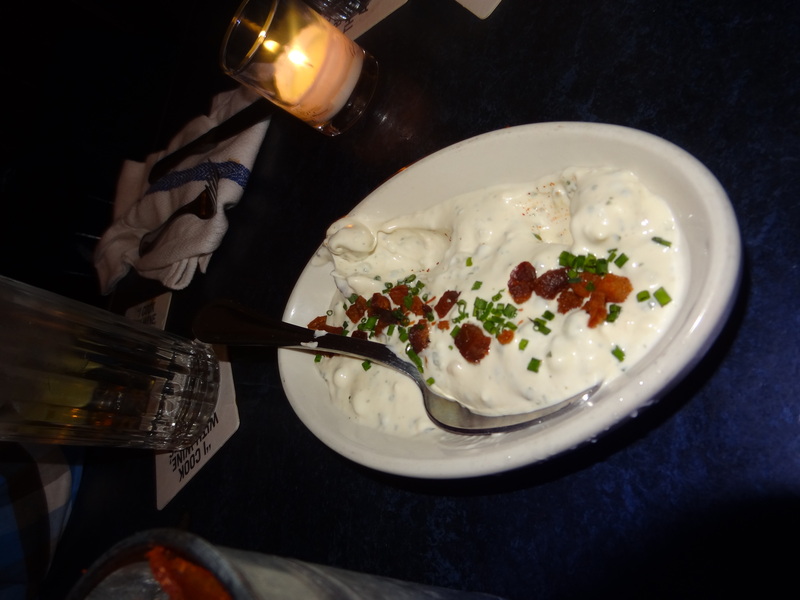 I discovered this place after seeing their Homemade BBQ Potato Chips (video of the chips… mmm!) featured in an episode of “Best Thing I Ever Ate” on the Food Network. There was one item on the menu that all three of us wanted to get first: Brisket Burnt Ends. 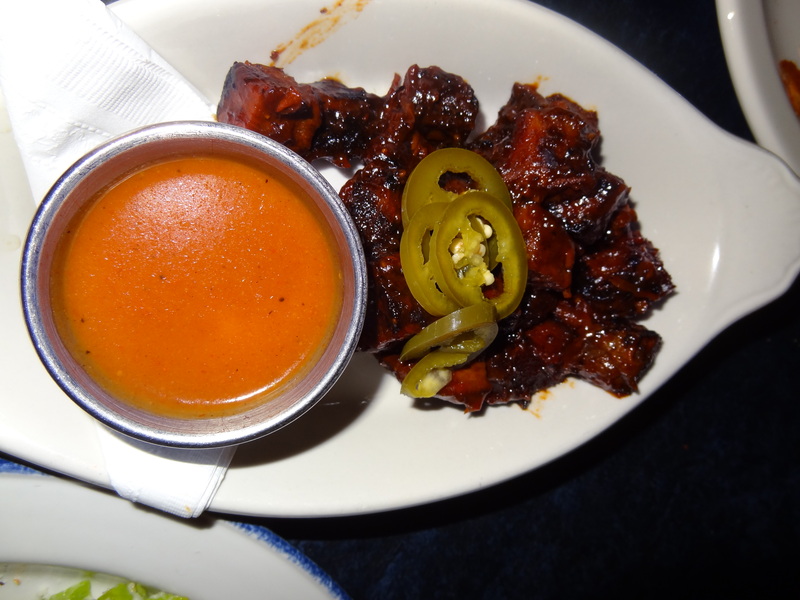 The Burnt Ends appetizer is what swayed us to order a few appetizers and split them, rather than getting a whole BBQ platter. We just had to try those Burnt Ends! 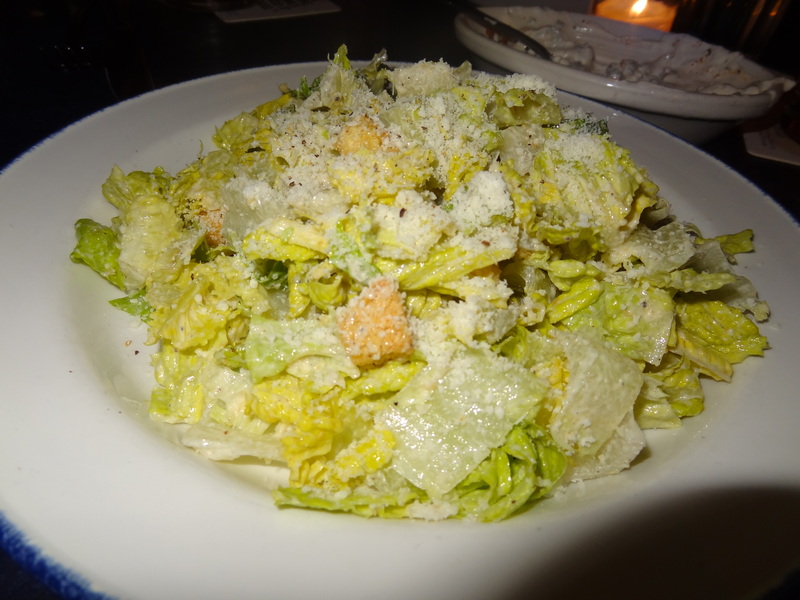 Ceasar Salad, Hush Puppies w/ Jalepeno Marmalade, the Homemade BBQ Chips w/ Blue Cheese & Bacon Dip, and the Steamed Green Beans (we had to have something green on the table) were all on the list too. We sipped on our drinks and the food came out really fast. The burnt ends were to DIE FOR! 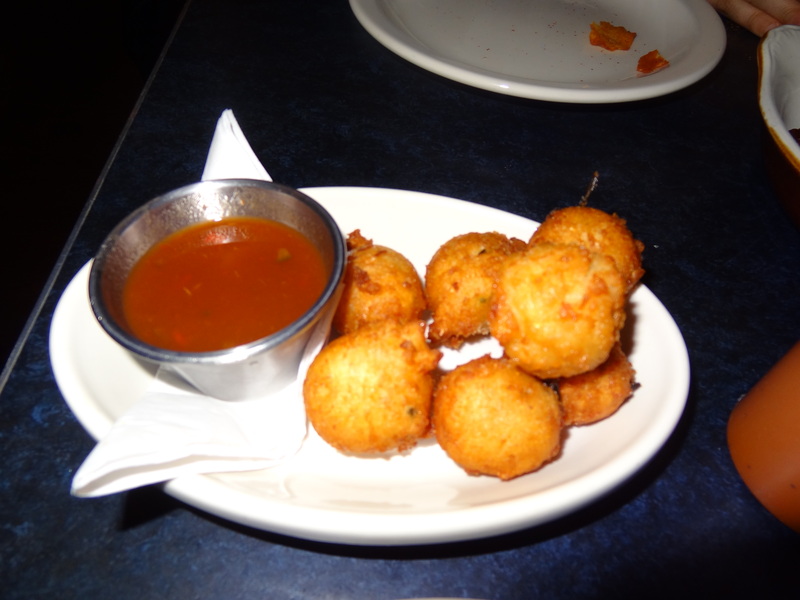 Once we each tried a piece, we realized that we had to order a second before it was too late. The BBQ chips were really good but I thought the flavor was a little predictable. 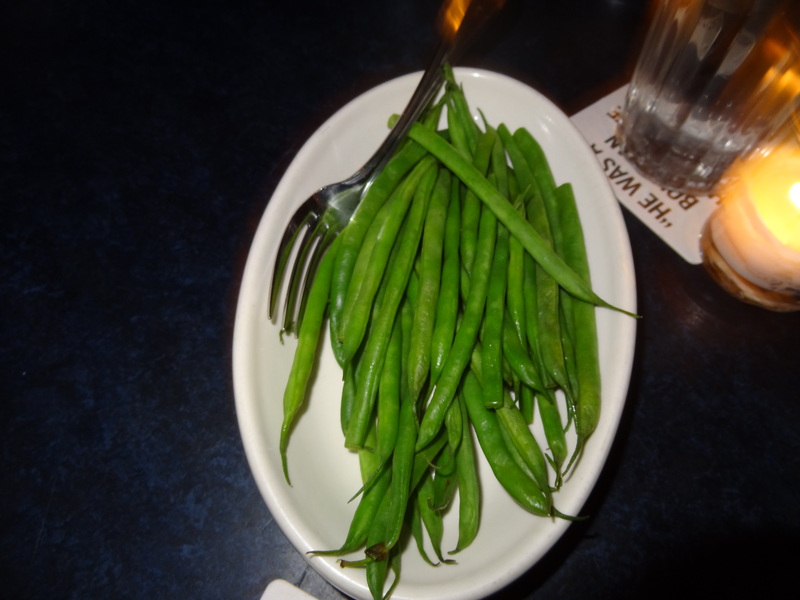 It was very cool though, since they were fresh and still warm. I thought the winner of this meal was a tie between the Brisket Burnt Ends & the Jalepeno Marmalade that came alongside the Hush Puppies. I even dipped the Brisket in there! 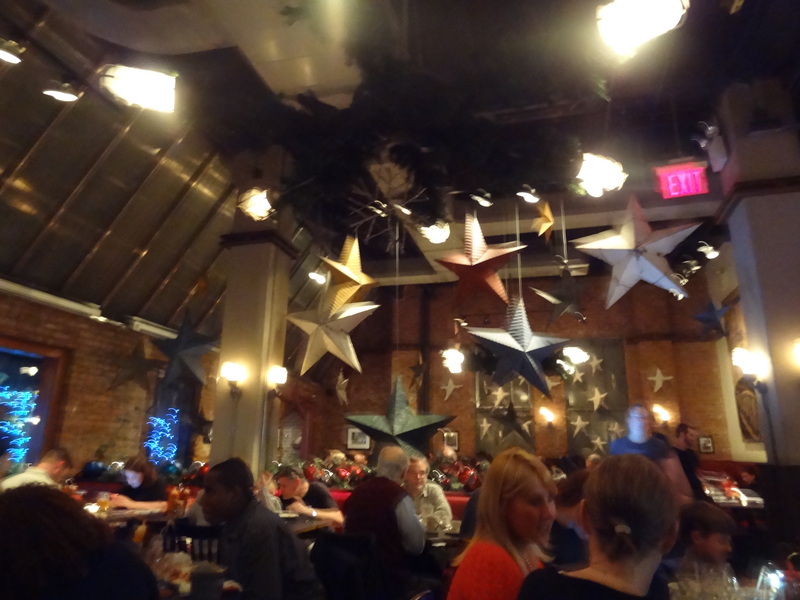 The meal was awesome, and I really liked the atmosphere of this place. I would definitely recommend it! ... last but not least ... BRISKET BURNT ENDS! We spent the rest of the night out for Dave’s friend Adam’s birthday. 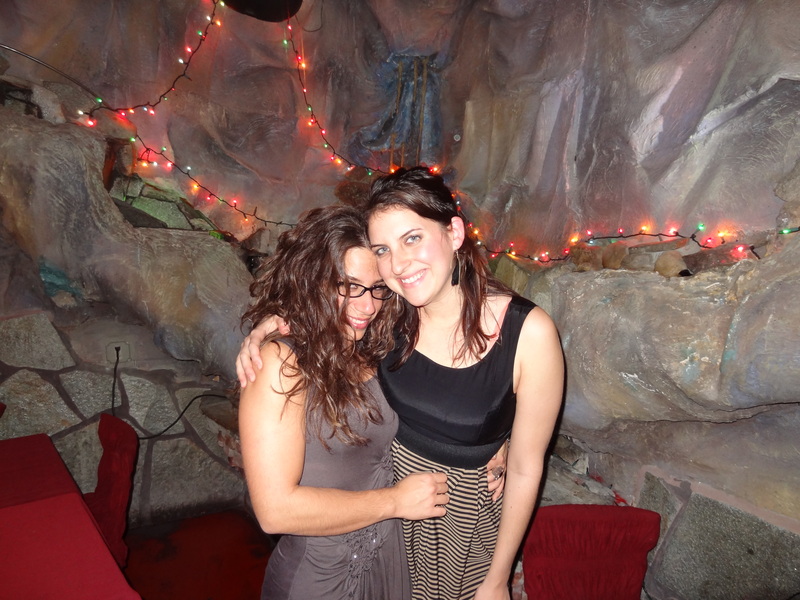 They wanted to go to a bar that looked like the inside of a cave or something you’d find on the Star Wars planet Tatooine. It was fun but pretty mellow. I always find it hard to go out on Fridays when I have work in the morning. 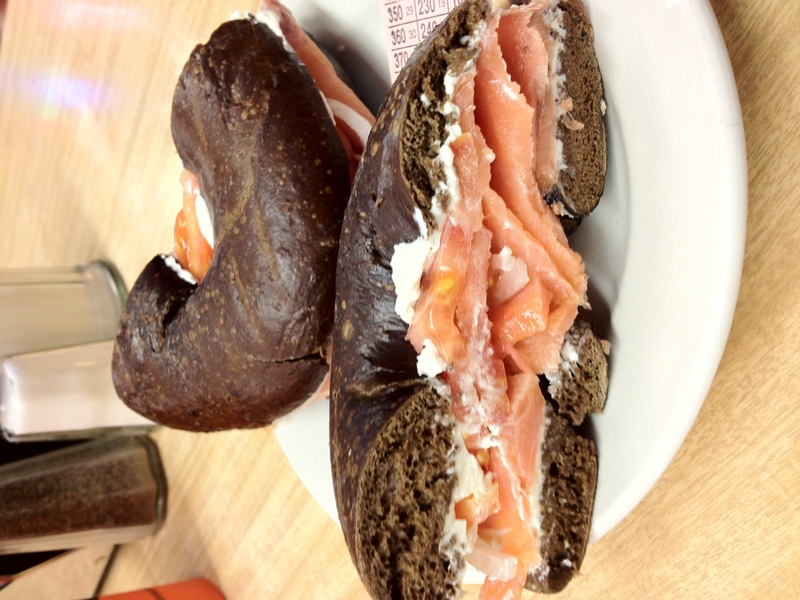 The Lox was just fair, I would never get it again at Katz! 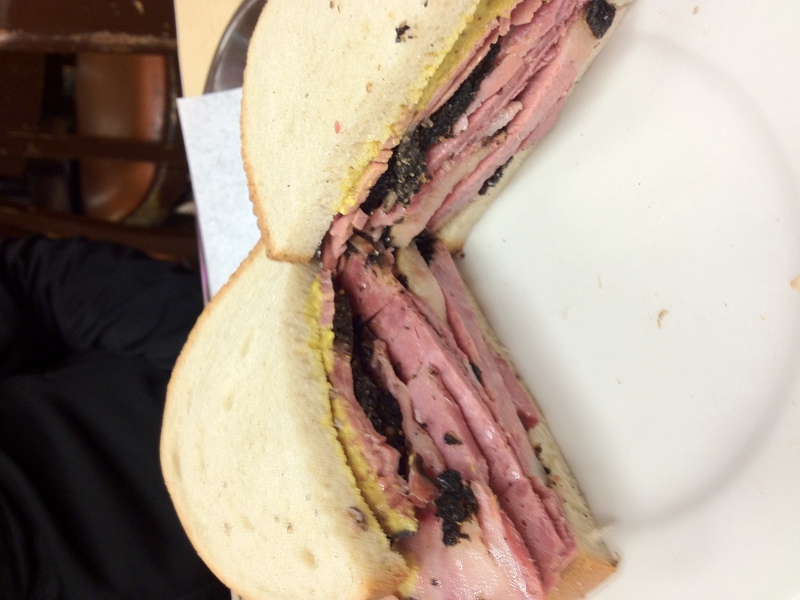 Stick with the Pastrami for sure. 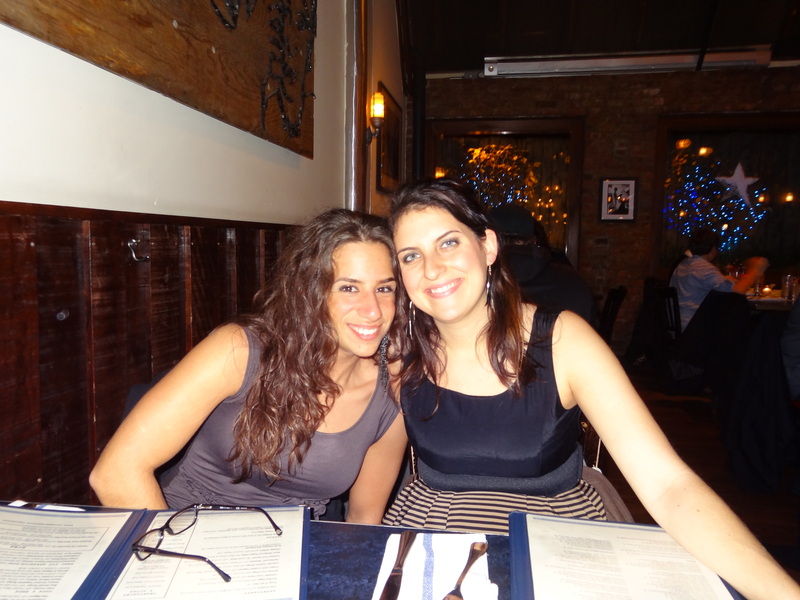 There is never enough time in NYC to see and do everything! 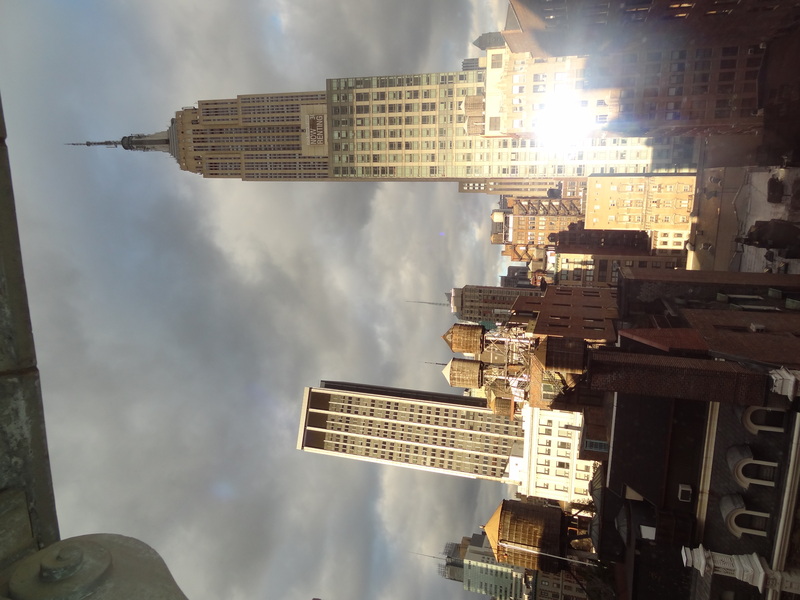 I still have never been to the Empire State Building, but I am satisfied for now with that gorgeous view we had from our hotel room… Until next trip! Hope you all had a wonderful holiday!